2.5" Drive Sled for 2 Apple Mac Pro. Simply attach your 2.5" drive to the bracket using the four included hard drive mounting screws and swap with an existing 3.5" drive tray. Mac Mini 2011 & 2012 HDD or SSD Internal Disk Doubler Kit. You can add a second internal HDD or SSD in a Mac Mini with the kit. Opened to take picture. OWC'Data Doubler' SSD/2.5" Hard Drive installation Kit. A window will open. Scroll to the "LocationÃ¢â‚¬ï†� item. Choose the kit that matches your Ã¢â‚¬Å“LocationÃ¢â‚¬ï†� item. This unit is for Connection ID "Lower". 2.5" Drive Sled for 2009-2012 Apple Mac Pro. Simply attach your 2.5" drive to the bracket using the four included hard drive mounting screws and swap with an existing 3.5" drive tray. Add any 2.5" Hard Drive or SSD to your Apple Mac Pro! Includes everything needed to replace your optical drive with a second drive or Solid State Drive. Installed drives are recognized like any other SATA device and can be setup and partitioned using the Apple Disk Utility application. OWC 5-Piece Mini Toolkit. Running out of storage space in your Mac mini or looking to improve performance with an OWC SSD?. Technical support for this DIY product consists only of this video Data Doubler for Mac mini (2011-2012) Installation Guide (Download Only). Add any 2.5" Hard Drive or SSD to your Apple Mac Pro! Simply attach your 2.5" drive to the bracket using the four included hard drive mounting screws and swap with an existing 3.5" drive tray. The OWC Mount Pro 2.5 perfectly aligns the SATA connection from your 2.5" drive into the back plane SATA ports on the Mac Pro. 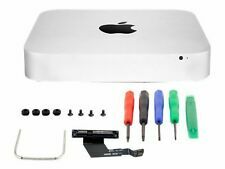 Once you've installed the entire Data Doubler drive assembly into your 2010 Mac mini's optical drive bay, you can customize how you want your internal storage to perform. Drive customization is easy and built right into OS X as the new Data Doubler mounted drive can be setup using Apple's Disk Utility program in which you can format the drive, create a RAID array using two drives together, or partition the new drive. OWC Mount Pro 2.5" Drive Sled for 2009-2012 Apple Mac Pro Add any 2.5" Hard Drive or SSD to your Apple Mac Pro! Installation is a breeze. Simply attach your 2.5" drive to the bracket using the four included hard drive mounting screws and swap with an existing 3.5" drive tray. OWC Data Doubler Optical Bay Hard Drive/SSD Mounting Solution For 2009 Mac mini Computers " Accessories. Category: Internal Solid State Drives. Manufacturer Part Number (MPN). (1 Year OWC Limited Warranty. Supports: SATA 6Gb/s, 3Gb/s & 1.5Gb/s Interface 2.5" Drive or SSD (Solid State Drive) of up to 12.5mm height. Mac mini 2009 Optical Bay Drive/SSD Mounting Solution. Compatible with 2009 Mac mini Model ID: Macmini3,1 9Not compatible with Mac mini server 2009). Once you've installed the entire Data Doubler drive assembly into your 2009 Mac mini's optical drive bay, you can customize how you want your internal storage to perform. Drive customization is easy and built right into OS X as the new Data Doubler mounted drive can be setup using Apple's Disk Utility program in which you can format the drive, create a RAID array using two drives together, or partition the new drive.